Third, Italian politicians hold a substantial influence inside the Vatican walls -and, of course, the Italian State returns the favour. That is to say, that if you aim at being or being considered as a ‘somebody’ in Italy, support from the Catholic Church is pivotal, when not mandatory. -Courtesy of the heritage of the prestige once held by the Catholic Church. However, it is a matter of fact that whenever something ‘typically Italian’ happens, everyone’s in search for declarations from the Holy See. As if it were up to the Holy See to ‘license’ this or that Italian politician, or to vote or veto Italian laws. As if the reactions from the high ranks of the Catholic Church were pivotal. For the Catholic believer, in fact, the main point of reference is actually always him: the parish priest. It is the parish priest who knows his own flock, who teaches and talks about the meaning of sin, who has to be able to value those who attend his church. Moreover, declarations from the Church are often sought after just to bring to light the total separation between the world of the institutional Church and the world of parishes. Divergences are nonetheless obvious, as on one side you have a centralised government while on the other one you have a general moral sense. The former does not act according to moral consciousness, but to diplomacy. The latter is alive. The former is the re-assuring face of the Church, the latter is its beating heart. For the Holy See, however, the risk is that of depending too much on Italy and the Italian State. It’s paradoxical if we think that the Church had established a temporal State just to keep itself free from national powers and all the faults that follow the creation of a State: competition for power, lack of spirituality, corruption (just to name a few). It is sufficient to have a look at the relationships of the Holy See with the sphere of Italian politics to see how the latter has -subtly, almost tiptoeing- imposed itself as major influencer for the former. And nevertheless, these contacts seem to be impossible to disregard for the political side of the Catholic Church. In this scenario, a key figure is Mr. Giulio Tremonti, current Minister of Economy and Finance – considered by many as the possible next Prime Minister. His cross-class support is said to be so widespread to reach even the highest floor of the Apostolic Palace. Pope Benedict, in fact, holds him in high esteem; so much that last summer he invited Mr. Tremonti for lunch in his abode in Castel Gandolfo. Apparently, their contacts started in 2006 during the papal holiday in Lorenzago di Cadore. They were introduced by the former President of the Venetian Region Mr. Giancarlo Galan -even though Mr. Tremonti doesn’t need any external references. His relationship with the Holy See, in fact, is now consolidated. It was Mr. Tremonti to engineer, in 1984, the introduction for the Otto per mille mechanism, according to which a part of the taxes paid by every Italian taxpayer is devolved to either the Catholic Church or some other organisation -State included. However, if no other specific group is selected as an Otto per mille beneficiary, the money is automatically re-distributed into the several organisations -according to proportionality. However, in a recent interview Cardinal Attilio Nicora, president of APSA (Administration of the Patrimony of the Apostolic See) and of the Authority for Financial Information (the institution controlling the Vatican accounts), criticised this mechanism for binding the Catholic Church to the Italian state. 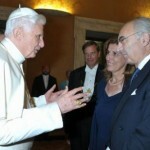 And for binding the Vatican entourage to Mr. Tremonti, who, in the meantime, has extended his influence even further. In a difficult moment for the Italian government, while the Minister had to deal with financial matters and the Stability and Growth Pact, Mr. Tremonti attended one of the seminars of the Ior regularly held with investors from the Congregations. The seminar was -obviously- private, even though highly publicised. Not surprisingly, the president of the IOR Mr. Ettore Gotti Tedeschi is the ethical consultant for the Italian Minister and their partnership is well consolidated. In the middle of the so-called ‘Ruby-gate’ -the sexual scandal that allegedly involved the Italian Prime Minister- the Italian government happened to cancel the tax it had imposed on those ecclesiastical properties which are not worship sites. The tax had been issued as part of a recent law regarding ‘fiscal federalism’, but also because Bruxelles was starting to investigate the matter. However, shortly before the Permanent Council of Italian Episcopal Conferecen (the meeting that a sort of ‘little Paliament of bishops’ holds twice a year), the exemption re-appeared. And, in return, the episcopal hit-out the opposition was waiting for never arrived. It’s these things that make the institutional Catholic Church so attached to Italian politics -maybe even too much. In the meantime, there’s a Church outside Italy, and outside Europe, that is cracking up. And, as an example, the recent establishment of the Pontifical Council for the promotion of the New Evangelisation is a proof of the tangibility of the problem. According to an observer very close to the Vatican, «The Catholic Church now exists in Italy only. Anywhere else in Europe it has practically disappeared». Hi there it’s me, I am also visiting this website regularly, this web site is truly pleasant and the people are genuinely sharing nice thoughts. Somebody necessarily assist to make severely posts I’d state. That is the first time I frequented your web page and thus far? I surprised with the research you made to create this actual post incredible. Magnificent activity!